Welcome to Day 4 of the 31 Days of Halloween! 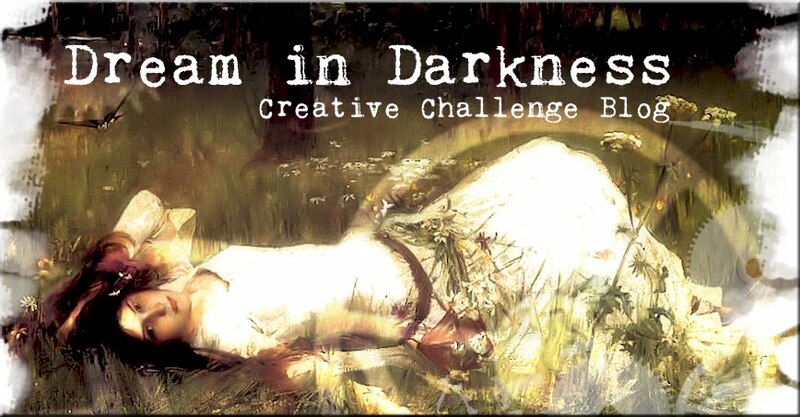 This is an annual Smeared Ink event and we are so thrilled to be playing along as Wicked Bloggers. The Wicked Blogger challenge is to post a new creation each day during October that contains a stamped image, digi or rubber! 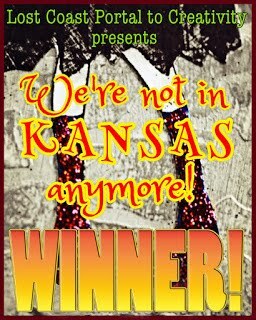 Check out all the rules and prize details at Smeared Ink. 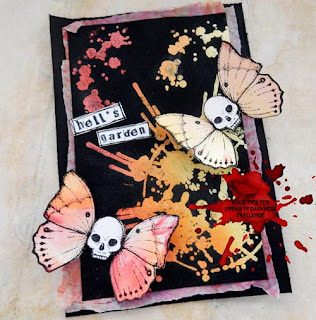 "Hell's Garden" postcard sized canvas. The winged are colored using Distress Ink. The ink splats are clear embossed over a Distress Ink background. Have a fantastic day hoppin'! 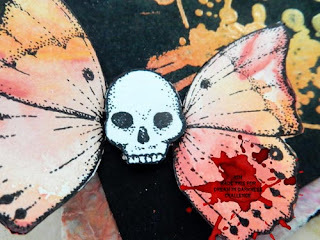 Skull butterflies! Whatever will turn up next! Love it, those butterflys are great! 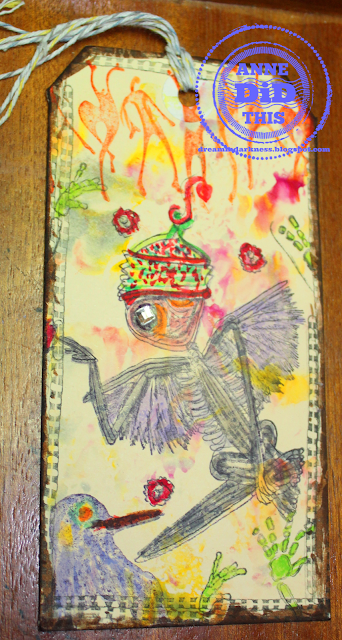 A very colourful piece of art work, cool butterfly, eeek who got splattered! What a fantastic background! I am lovin your card. 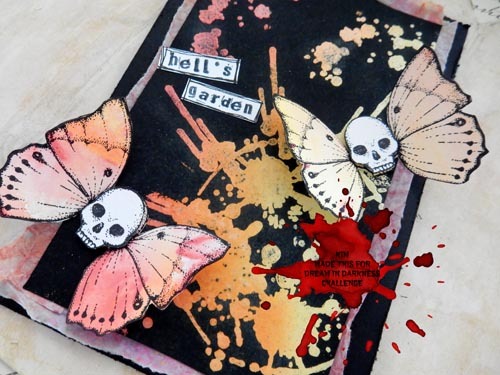 Absolutely GORE-gous Kim, I just adore what you've done here combining pastels with scary, oh my! Very striking! Love every bit! Ghoulish butterflies. I usually love butterflies but these - not so much. Great idea for your garden. 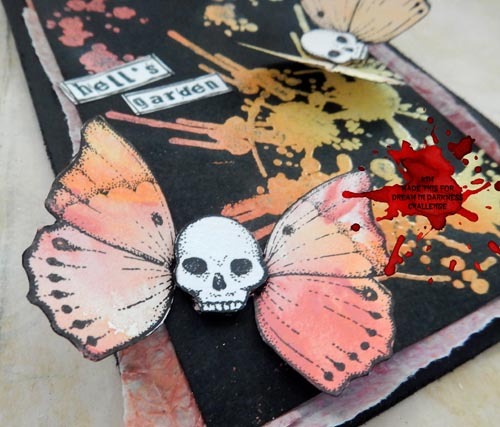 Great job, really love that background a perfect foil for those creepy undead butterflies! Great little canvas--love those skull butterflies! Skull butterflies.... sure are spooky... wouldn't want them flying in my garden!!! TFS!